Jimmy Fortune » Jimmy will be on a new episode of Dailey & Vincent on 4-30-16. « Country Music Cruise 2017 with Vince Gill, Oak Ridge Boys, Charlie Pride and more! 4 Comments to Jimmy will be on a new episode of Dailey & Vincent on 4-30-16. Can a DVD be purchased of the 4.30.2016 show on RFDTV Jimmie Fortune was the guests. You will need to check with Dailey & Vincent to see if they are going to release their show on DVD. 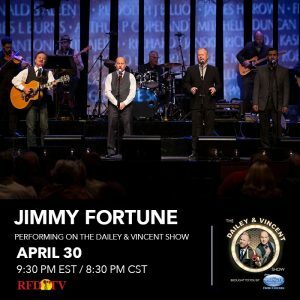 what was the song Jimmy Fortune sung with Dailey & Vincent on the April 30th 2016 show. My husband died on 1-5-15 and this song was so special to me, but i cant remember the name of it This was my husbands birthday also. We were married for 40 years when he passed away. I’m not sure which show you saw. There are several of them. Could it possibly be I Believe?